Folder vs. Folder and Compare all is to reduce the number of comparisons in Find.Same.Images.OK, for example, if they know that original images must be in a folder. 1.) ... Understand Image Comparison Folder Vs. Folders! 2.) ... Include or exclude the image comparison in sub-folder! See also: ► What is the meaning of Find.Same.Images, for what? 1.) Image Comparison Folder Vs. Understand folders! Folder vs. Folder you have 20 images in the first folder and the folder with the original images has 20 thousand images. Is the maximum of the required comparisons 20 x 20.000 = 400.000 Comparisons. (20K x 20K)/2 - (20K/2) = 200 000 000 - 10 000 =200 Millions comparisons. OK. That's too much math now, but in any case, it's a lot more when every photo has to be compared! But the program is fast enough to master such tasks and to find similar or the same pictures ergo photos under Windows. Tip: ► I found thousands of photos, how could I select all? 2.) Include or exclude the image comparison under / sub -folder! (Image-1) Exclude and Include Sub-Folder at Image Compare! This screenshot has been made on Windows 10, you can use this example folder vs. folder Compare and All Images Comparison, also as a solution on previous versions of MS Windows operating systems as a fast image comparison software. 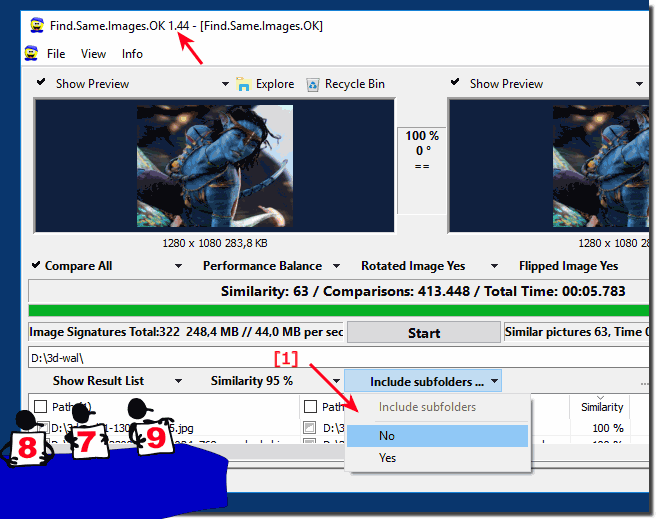 It really makes perfect sense to use this simple yet effective tool to search for duplicate images, whether it's a Windows Home Desktop Computer, or on the go on the tablet PC, Surface Pro / Go, or even on a professional Server operating system. Find.Same.Images.OK - FAQ-2: Folder vs. Folder and Compare all?